Chyle fistula is defined as a leakage of lymphatic fluid from the lymphatic vessels, typically accumulating in the thoracic or abdominal cavities but occasionally manifesting as an external fistula. It is a rare but potentially devastating and morbid condition. First described in the 17th century as complications of trauma, chyle fistulas most commonly occur secondary to lymphatic disease or malignancy or following abdominal, neck, or thoracic operations. [1, 2] Chyle fistulas also can form as a result of venous hypertension, and they have been described in patients with superior vena cava syndrome or thrombosis of the vena cava. Chyle fistulas can cause extreme morbidity because of loss of fluids, electrolytes, and other nutrients. In addition, chyle fistulas can result in loss of lymphocytes and immune dysfunction. Finally, chyle fistulas are space-filling and exert pressure on surrounding tissues, creating symptoms that can range from minimal discomfort to life-threatening situations. The cisterna chyli and thoracic duct drain lymph from the entire body except the head, neck, arms, and right thorax (which instead use the right bronchomediastinal, jugular, and subclavian lymph trunks to form the right lymph duct). The anatomy is highly variable; 50% of people do not have an identifiable cisterna chyli. In addition, half of the 4 L of lymph draining through the cisterna chyli and thoracic duct originates from the intestinal and hepatic lymphatics. The cisterna chyli is found on the posterolateral edge to the right of the aorta at the level of vertebral bodies T12, L1, L2, and L3 as lymphatics from the mesentery, intercostal, and lumbar regions coalesce in the retroperitoneal space. 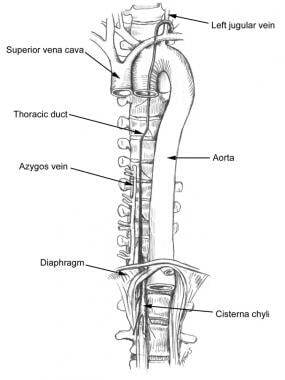 At approximately L1, the cisterna chyli ascends, becoming the thoracic duct (see the image below). The duct then enters the posterior mediastinum, crosses at T4 into the left retropleural space, and continues in a cephalad direction. The thoracic duct then enters the venous system at the junction of the left subclavian and internal jugular veins). Chyle fistula. Anatomy of the thoracic duct in relation to the aorta. Leakage of lymph from damaged lymph vessels is common after surgery or trauma. However, damaged lymphatics most often heal spontaneously or direct lymph centrally via rich interconnected lymphatic collaterals, without any significant morbidity. For chyle fistulas to form, either a scarcity of lymphatic collaterals must be present or the injury to the lymphatic channels must overwhelm the remaining lymphatic vessels. In addition, abnormal lymphatic vessels may be incapable of adequate lymph flow, leading to the accumulation of chyle. Chyle flow varies dramatically depending on the quantity and quality of oral intake. During times of starvation, chyle flow is minimal. After meals, especially those with high contents of long-chain fatty acids, chyle flow increases dramatically. This basic knowledge provides the rationale for controlling dietary intake as part of the treatment of this disease. Lv S, Wang Q, Zhao W, Han L, Wang Q, Batchu N, et al. A review of the postoperative lymphatic leakage. Oncotarget. 2017 Apr 20. 5(3):247-52. [Medline]. Delaney SW, Shi H, Shokrani A, Sinha UK. Management of Chyle Leak after Head and Neck Surgery: Review of Current Treatment Strategies. Int J Otolaryngol. 2017. 2017:8362874. [Medline]. Cerfolio RJ, Allen MS, Deschamps C, Trastek VF, Pairolero PC. Postoperative chylothorax. J Thorac Cardiovasc Surg. 1996 Nov. 112(5):1361-5; discussion 1365-6. [Medline]. Strobel O, Brangs S, Hinz U, Pausch T, Hüttner FJ, Diener MK, et al. Incidence, risk factors and clinical implications of chyle leak after pancreatic surgery. Br J Surg. 2017 Jan. 104 (1):108-117. [Medline]. Ahn D, Sohn JH, Jeong JY. Chyle Fistula After Neck Dissection: An 8-Year, Single-Center, Prospective Study of Incidence, Clinical Features, and Treatment. Ann Surg Oncol. 2015 Dec. 22 Suppl 3:S1000-6. [Medline]. Weniger M, D'Haese JG, Angele MK, Kleespies A, Werner J, Hartwig W. Treatment options for chylous ascites after major abdominal surgery: a systematic review. Am J Surg. 2016 Jan. 211 (1):206-13. [Medline]. Press OW, Press NO, Kaufman SD. Evaluation and management of chylous ascites. Ann Intern Med. 1982 Mar. 96(3):358-64. [Medline]. Kadota H, Kakiuchi Y, Yoshida T. Management of chylous fistula after neck dissection using negative-pressure wound therapy: A preliminary report. Laryngoscope. 2012 May. 122(5):997-9. [Medline]. Wu G, Chang X, Xia Y, Huang W, Koch WM. Prospective randomized trial of high versus low negative pressure suction in management of chyle fistula after neck dissection for metastatic thyroid carcinoma. Head Neck. 2012 Dec. 34(12):1711-5. [Medline]. Browse NL, Allen DR, Wilson NM. Management of chylothorax. Br J Surg. 1997 Dec. 84(12):1711-6. [Medline]. Hayden JD, Sue-Ling HM, Sarela AI, Dexter SP. Minimally invasive management of chylous fistula after esophagectomy. Dis Esophagus. 2007. 20(3):251-5. [Medline]. Pabst TS 3rd, McIntyre KE Jr, Schilling JD, Hunter GC, Bernhard VM. Management of chyloperitoneum after abdominal aortic surgery. Am J Surg. 1993 Aug. 166(2):194-8; discussion 198-9. [Medline]. Patel MS, Jimenez JC, Williams RA, Wilson SE. Management of chyloperitoneum and chylothorax after aortic reconstruction. Stanley JC, Veith FJ, Wakefield TW, eds. Current Therapy in Vascular and Endovascular Surgery. 5th ed. Philadelphia: Elsevier Saunders; 2014. 480-4. HASHIM SA, ROHOLT HB, BABAYAN VK, VANITALLIE TB. TREATMENT OF CHYLURIA AND CHYLOTHORAX WITH MEDIUM-CHAIN TRIGLYCERIDE. N Engl J Med. 1964 Apr 9. 270:756-61. [Medline]. Mincher L, Evans J, Jenner MW, Varney VA. The successful treatment of chylous effusions in malignant disease with octreotide. Clin Oncol (R Coll Radiol). 2005 Apr. 17(2):118-21. [Medline]. Nyquist GG, Hagr A, Sobol SE, Hier MP, Black MJ. Octreotide in the medical management of chyle fistula. Otolaryngol Head Neck Surg. 2003 Jun. 128(6):910-1. [Medline]. Shah D, Sinn JK. Octreotide as therapeutic option for congenital idiopathic chylothorax: a case series. Acta Paediatr. 2012 Apr. 101 (4):e151-5. [Medline]. Horvers M, Mooij CF, Antonius TA. Is octreotide treatment useful in patients with congenital chylothorax?. Neonatology. 2012. 101 (3):225-31. [Medline]. Swanson MS, Hudson RL, Bhandari N, Sinha UK, Maceri DR, Kokot N. Use of Octreotide for the Management of Chyle Fistula Following Neck Dissection. JAMA Otolaryngol Head Neck Surg. 2015 Aug. 141 (8):723-7. [Medline]. Jain A, Singh SN, Singhal P, Sharma MP, Grover M. A prospective study on the role of Octreotide in management of chyle fistula neck. Laryngoscope. 2015 Jul. 125 (7):1624-7. [Medline]. Chan JY, Wong EW, Ng SK, van Hasselt CA, Vlantis AC. Conservative management of postoperative chylous fistula with octreotide and peripheral total parenteral nutrition. Ear Nose Throat J. 2017 Jul. 96 (7):264-267. [Medline]. Singh M, Deo SV, Shukla NK, Pandit A. Chylous fistula after axillary lymph node dissection: incidence, management, and possible cause. Clin Breast Cancer. 2011 Oct. 11(5):320-4. [Medline]. de Vries GJ, Ryan BM, de Bievre M, Driessen A, Stockbrugger RW, Koek GH. Cirrhosis related chylous ascites successfully treated with TIPS. Eur J Gastroenterol Hepatol. 2005 Apr. 17(4):463-6. [Medline]. Gunnlaugsson CB, Iannettoni MD, Yu B, Chepeha DB, Teknos TN. Management of chyle fistula utilizing thoracoscopic ligation of the thoracic duct. ORL J Otorhinolaryngol Relat Spec. 2004. 66(3):148-54. [Medline]. Vasko JS, Tapper RI. The surgical significance of chylous ascites. Arch Surg. 1967 Sep. 95(3):355-68. [Medline]. Zabeck H, Muley T, Dienemann H, Hoffmann H. Management of chylothorax in adults: when is surgery indicated?. Thorac Cardiovasc Surg. 2011 Jun. 59(4):243-6. [Medline]. Seelig MH, Klingler PJ, Oldenburg WA. Treatment of a postoperative cervical chylous lymphocele by percutaneous sclerosing with povidone-iodine. J Vasc Surg. 1998 Jun. 27(6):1148-51. [Medline]. Ikard RW. Iatrogenic chylous ascites. Am Surg. 1972 Aug. 38(8):436-8. [Medline]. Huang PM, Lee YC. A new technique of continuous pleural irrigation with minocycline administration for refractory chylothorax. Thorac Cardiovasc Surg. 2011 Oct. 59(7):436-8. [Medline]. Chyle fistula. Management of chyloperitoneum. Chyle fistula. Management of chylothorax.